Citation Information: J Clin Invest. 2011;121(9):3657-3665. https://doi.org/10.1172/JCI57762. Pneumococcal infection of the respiratory tract is often secondary to recent influenza virus infection and accounts for much of the morbidity and mortality during seasonal and pandemic influenza. 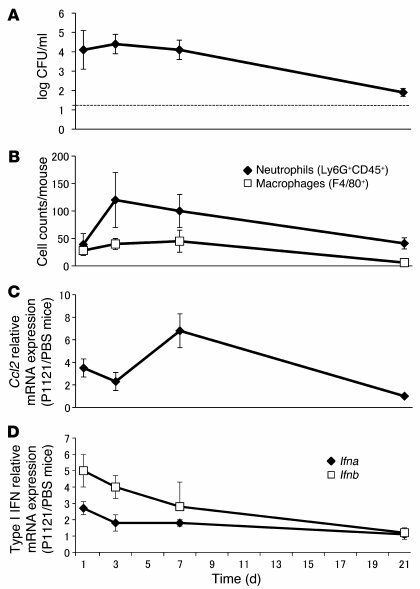 Here, we show that coinfection of the upper respiratory tract of mice with influenza virus and pneumococcus leads to synergistic stimulation of type I IFNs and that this impairs the recruitment of macrophages, which are required for pneumococcal clearance, due to decreased production of the chemokine CCL2. Type I IFN expression was induced by pneumococcal colonization alone. Colonization followed by influenza coinfection led to a synergistic type I IFN response, resulting in increased density of colonizing bacteria and susceptibility to invasive infection. This enhanced type I IFN response inhibited production of the chemokine CCL2, which promotes the recruitment of macrophages and bacterial clearance. Stimulation of CCL2 by macrophages upon pneumococcal infection alone required the pattern recognition receptor Nod2 and expression of the pore-forming toxin pneumolysin. Indeed, the increased colonization associated with concurrent influenza virus infection was not observed in mice lacking Nod2 or the type I IFN receptor, or in mice challenged with pneumococci lacking pneumolysin. We therefore propose that the synergistic stimulation of type I IFN production during concurrent influenza virus and pneumococcal infection leads to increased bacterial colonization and suggest that this may contribute to the higher rates of disease associated with coinfection in humans. Type I IFNs are expressed during pneumococcal carriage. (A) URT lavages were analyzed for quantitative culture at the time points indicated, following intranasal inoculation of C57BL/6 WT mice with strain P1121. Dashed line represents the limit of detection. (B) URT lavages from colonized mice were analyzed by flow cytometry to quantify numbers of neutrophils and macrophages. (C) Levels of Ccl2 mRNA in URT tract lavages were determined using qRT-PCR at each time point and expressed relative to uncolonized mice. (D) Levels of type I IFN mRNA in URT lavages were determined using qRT-PCR at each time point and expressed relative to uncolonized mice. n = 10–15 mice per time point. Values represent mean ± SD.